I am wanting to share my joy with you by having another giveaway! In celebration of my first Mixed Media class over at Creative Workshops on Altered Domino Books, I am giving away a box full of goodies to make your own domino books! 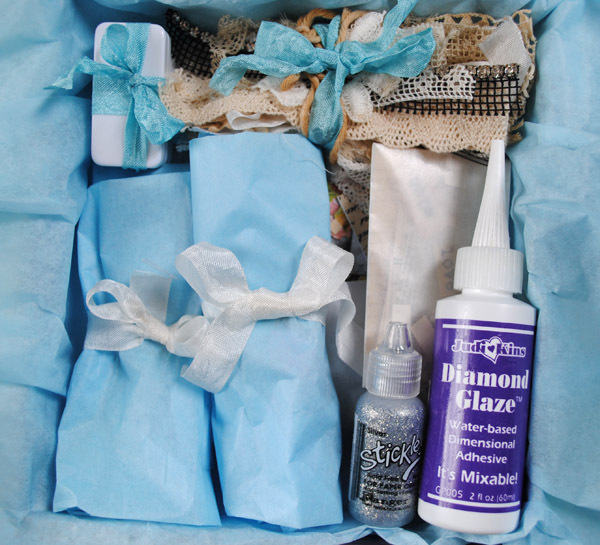 There are all kinds of items from my art room that you could use to start creating your own! With Domino books you only need to think small, tiny little pieces. 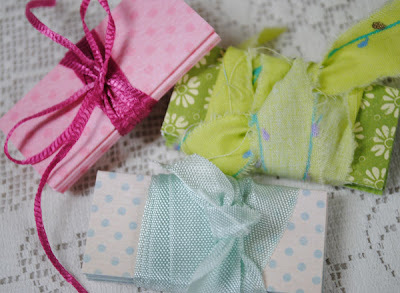 Which is so nice if you only have a little bit of your favorite paper or lace left, it can be used beautifully in one of these books! Diamond Glaze, Stickles and of course, dominos! I have been truly enjoying creating the video lessons for this class! It is full of all kinds of tips and techniques usable for creating domino books or any other type of art. 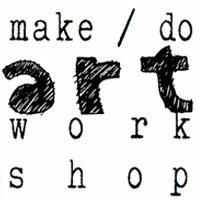 What I love about Creative Workshops is that you have at least a year to do your class, maybe even longer and you can start any time. Yay! I am so excited to share and play with any of you who might want to join in! 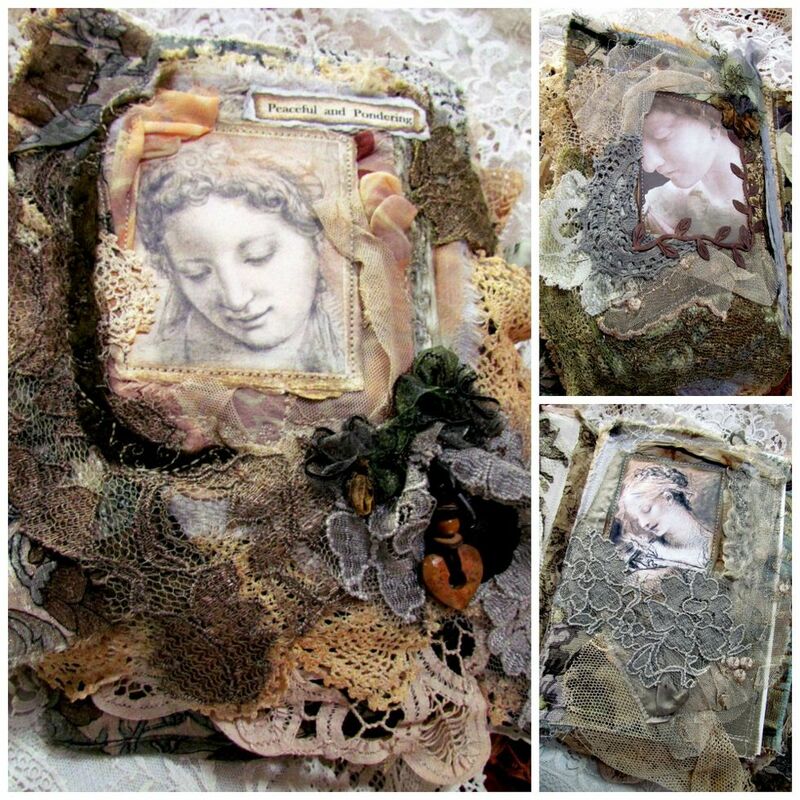 This Altered Domino Book Class begins October 10th. To enter my giveaway, all you need to do is to leave a comment...and of course be a follower. Just in case you haven't seen it before. I'm already a follower too and would love to win these goodies! Looks like an awesome class too! Count me in for this gorgeous giveaway Terri. I'm already a follower. Just watched your video taster, oh wow Terri am so loving your cake stand. They truly are addicting! Good luck to all the girls who enter! 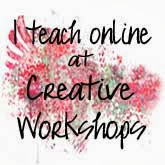 I had seen that you were teaching over on Creative Workshops!! Congratulations!! Ohhhh, I'd be tickled pink to win this fabulous giveaway! You are so generous!! ooooooooo!!!! so much fun, please enter me! What a wonderful and generous giveaway. I would love a chance to win this treasure. I am a follower. Have a wonderful week. I have been a follower for quite a while. I love your tutorials. And of course Tea Cup Tuesday. I would LOVE to be the winner of all these goodies. okay, I just became a follower even though I am not sure what that means! I do read your blog all the time whether I am a "follower" or not and love your tutorials. You are a natural! Enter me in your give-away. I would love to make one of those cute little books. i've just drooled over your dominoe books!!! i'd love the chance to win this marvelous giveaway!! Uh Terri, what a lovely give-away, you are so generous! I join in!! You are beyond generous! COngratulations on your class. oh I would love to be entered into your most generous giveaway and I am on my way over to see about your latest class! Of course i am a follower. Hope you are having a wonderful weekend. I have ben a follower for a while,this is an awesome give away, would love to win it! I would love to enter your giveaway. You have a very inspirational blog! Hi Terri! Please count me in on your wonderful giveaway! I love working on dominoes too and your tutorial is fabulous. Thank you for the chance. I am a follower and am so intrigued with the idea of a domino book! What a fun giveaway! Hi Terri! I am already a follower. I would love to win your celebration giveaway. I so want to start a domino book. Thanks! Have a great week! Oh what a lovely collection of treasures. I've admired the domino books for some time. Count me in please. That is one super awesome giveaway! Oh the great things one could make! What a lovely giveaway! Such wondrous goodies! You are so generous with your giveaways. I´m a followers for a long time. I'm already a follower and enjoy doing so. I love working with dominoes so I would love to win this giveaway. You are so generous with this give away. I have been trying to motivate myself to make a domino book for ages, your fabulous giveaway is just what I need to get me going! Thank you for the chance to win those gorgeous supplies, I am keeping my fingers crossed. I am already a follower. I'll put a link to this giveaway on my sidebar as well. These items are so beautiful! But then, all your posts are beautiful. 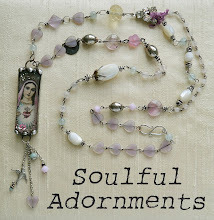 I joyfully follow your blog, and am excited to be part in this giveaway. Can't wait to see who the lucky one will be! I'm already a follower and I've seen the tiny pink book you did with the dominoes. Please enter my name for this beautiful giveaway. I already know I would make a French themed domino mini book with your goodies. Thank you and have a wonderful day. 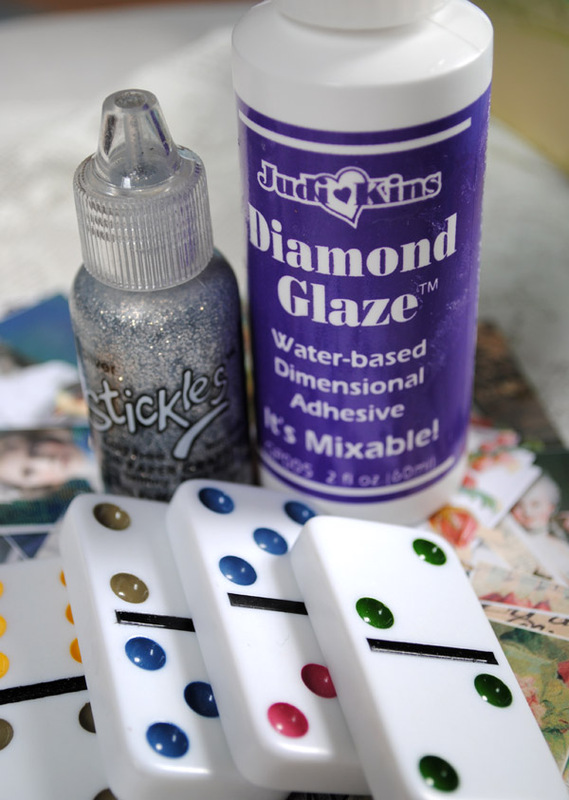 Those little domino books are so adorable and look like lot's of fun to make too!! Oh, my! I cannot wait to take your class, Terri! Ever since you showed one of these pretties (I think it was a couple of months ago. . ) I've been dying to know "how" you did it! You are very good at giving instructions, and I appreciate the free videos. You are so inspiring! Im new to your blog put you are one of the best! thanks for a chance to win! Your blog is inspiring! Everything is so beautiful! Thank you for the opportunity to win such a fun package and congrats on your new class!!! Of course I'm one of your faithful followers! You've helped me so much with my altered art! This giveaway is simply fabulous and I would love to be included in the drawing! Wow cool give away! Your soo kind! This sounds like so much fun ... I have a friend who would LOVE this. Very interested in the class. Yay So wonderful Terri...you are super generous as always and simply fabulous!I love your vids..you always so such a fantastic job..yay..shine on..you are a super-talented-creatrix! I would always love to win anything you share! Terri - Do consider me entered for this give-away! I have loved your domino books each time you've shared them - and would love to try my hand at them. As we come into the fall season, I am hopeful for many cozy evenings relaxing with crafting to keep me creatively primed! Such a great project this would be! I would have loved to have followed you to England, I too love Doc Martin, Martin Clunes, do you watch his new show Reggie Perry? Anywho, I would love to have your beautiful stuff to make a domino book, my niece just started Yale and I think she needs something pretty in her dorm room. Thanks Terri. I'm now a follower of your blog. 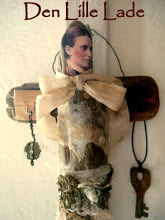 Your Mixed Media class on Altered Domino Books looks great. Thanks for the lovely giveaway. yes..please do enter me in to win! 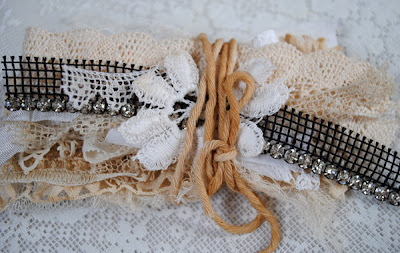 I love all of your yummy supplies..the laces ...papers..everything is so inspiring! A very generous and sweet giveaway--much good luck to you with your new videos! PS--Of COURSE I am a follower, too--have been for awhile, and I always look forward to your posts! Lovely giveaway!!! Thanks for the opportunity to enter. I'm already a follower!!! What a wonderful give away! So happy I discovered that one does not need to be on facebook to follow. Thank you and good luck to all your lovely followers. 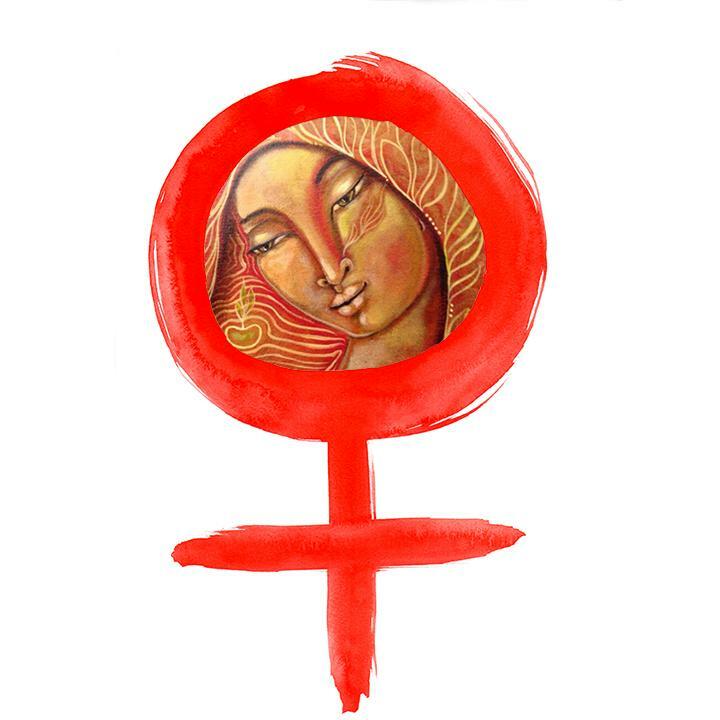 I have just joined this blog. I found it on another web site that I follow regularly. I have now added this to my bookmark list as well. Hope to be a winner, I have always wanted to do a domino book. Terri, congratulations on your new video class! I'm excited for you. Good luck to everyone on your giveaway, too. OOh! I am so excited about this giveaway! Thank you for your most interesting video, you are so generous. These are gorgeous...I do hope to win a class. Thank you! So glad I found your blog! I have been following your blog for some time but this giveaway has made me join as an official follower:) Those goodies are awesome. Looks like fun! Please enter me in your giveaway. Thanks for the chance! 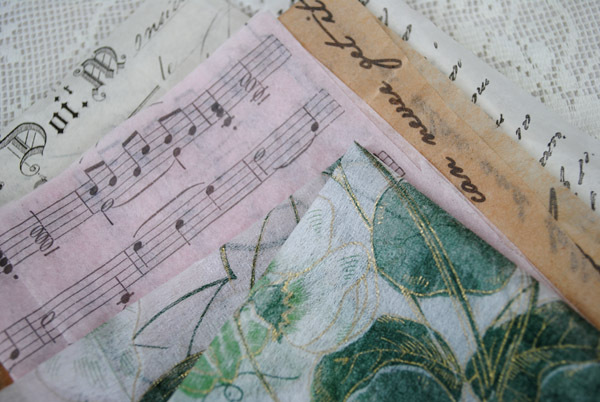 Already following you, and Terri, fabulous, this is a delightful offering of wonderful supplies--I've been eying these little books, and here you are with not only everything we need to make one, but the how-to, too! This looks like so much fun ... love your blog!! Hope I get a chance to play along. Thanks for the opportunity to win a kit! 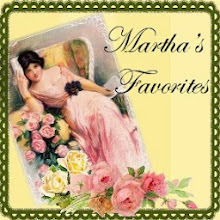 You are one of my favorite blogs to follow on my google reader! I found you from someone on Facebook and I have been looking around and came across this post. I have never make a book this way. Thanks for the change to try and win the giveaway. I'm new to your blog, and have now become an official follower. I would love to have a chance of winning your super giveaway. What a lovely blog you have with some amazing posts! I'm really looking forward to this class and it's just in time to make these little treasures for the holidays. Thank you for offering this generous giveaway! I just became a follower. I tried to become one at a previous time and I was not successful. But YAY I am now a follower. I would love to do the mini domino book. I am hooked on inchies. I love tiny little things like this. Your blog brings me peace. Hi, I am a new follower, i got here via Shabby Cottage Studio..I just love the idea of winning all of the goodie supplies to make a domino book...Fun! Just found your blog and love it! So I became a follower! Hi Terri, I hope that you're doing well! Congrats to you on your new class that's about to start! How wonderful and exciting! I'm very happy for you! The preview of your class looks fabulous! I haven't stopped at your blog for a bit now because of all my surgeries that I've been having again due to my kidneys but I'm so happy that I stopped in today! I've always loved your blog and your wonderful tutorials! Thank you so much for them! But if you would be so kind to enter my name in your awesome and so generous giveaway I would be most appreciative! I've been a follower of yours now for some time. Thank you so much for this opportunity! I hope that you have a lovely rest of your day! I am one of your many followers...your newest. Please enter me in your giveaway as I just discovered Domino Books and an enthralled with them. I am definitely one of your followers and oh my would I love to win this most generous giveaway! now who wouldn't want to win this kit? absolutely beautiful! thank you for the opportunity to win. love your blog and videos. Awesome kit! I wanna win! Oh my Terri what a beautiful bundle of treasures! Please count me in, it's my pleasure to enter your give-away; I love domino art. Already a follower and loving it. 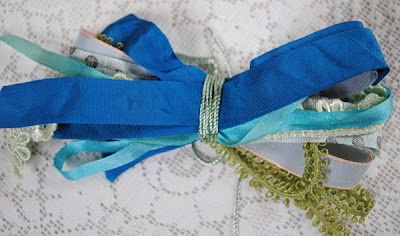 This is a lovely giveaway and the tutorial is awesome.Im a new follower found you on lululittz blog(I think I spelled that right lol)Please count me in for this. That was lululiz,I mess it up ha! We are name sakes. I'm a fairly new follower. I found you on pintrest and was blown away by your vintage shoes. LOVE THEM! I would love to win the give-away! My husband is working 600 miles away from home and I am here with him looking for things to do while I support him. Thank You for all your talent and awsomeness. Thank You for sharing with us! Hello and Spooky Thanks! I'm a "prisoner" here in the convalescent home in Sarasota. I've just finished eye of newt for dinner (and believe me it all tastes like that!). Please think of your restless spirit when setting loose your generous hounds! 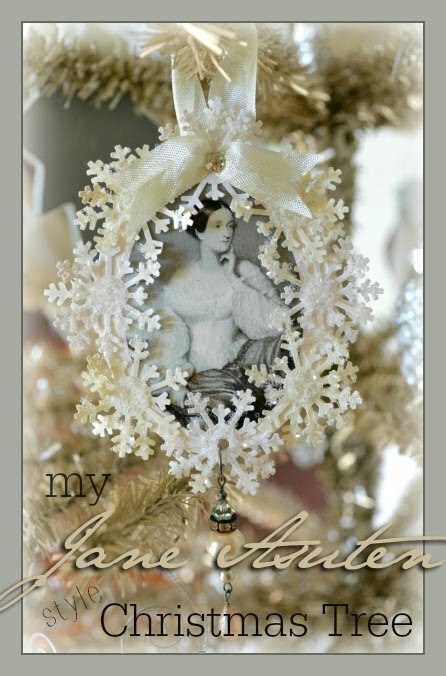 What a gorgeous and giveaway that you have Terri! I had originally became a follower from Teacup Tuesday but I have to say I love your creations and tutorials! You are so talented and creative....Thanks for the chance to win! I love your blog and have been following it for months! Love all your projects and teacups. I would love to be entered in your beautiful giveaway. Thank you! As a keen follower of your blog and great admirer of your tuts and projects I'd love to be included in your gorgeous givaway. 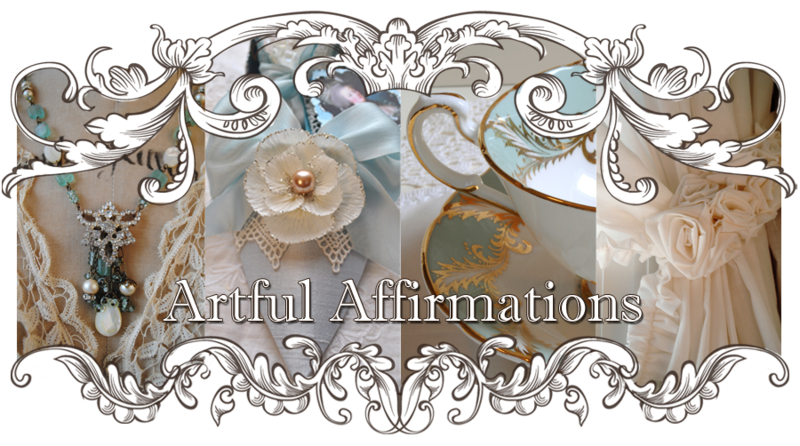 Thanks for stopping by and my blog for a tea time visit & Thanks for becoming a follower, I also, hadn't realized you weren't. That class sounds very tempting. I am a new follower - came on Tea Cup Tuesday. Pleased to make your acquaintance, looking forward to more of your artful affirmations. What a wonderful workshop and I can't think of anyone more qualified to teach it! 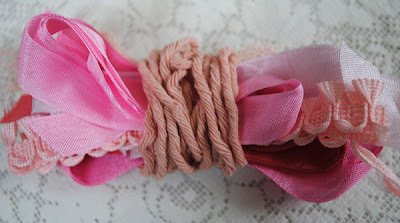 And what a thoughtful and lovely bunch of bits and bobs in the blog candy! Thanks for the chance! This looks a great givaway, I am so inspired by your domino books that I'd love to win and make my own! I am already a follower and would love to enter your generous give away. love an affirmation that's so generous! Thank you for your e-mail postings, Terri...I love your blog and your tutoriakl videos are so excellent. I am a follower and hope to be included in your giveaway. Kind regards.